Nori is probably the most widely eaten and recognizable sea vegetables in North America because of our love affair with sushi. “That black, paper-y stuff” my friend affectionately calls it, can be consumed in other ways besides rolling it around steamed rice and raw fish. Nori is also referred to as Sea Lettuce or Green Laver, and has a very mild, nutty, salty-sweet thing going on, so it is a versatile veg that doesn’t overpower the flavour of soups, salads, grains or even popcorn! 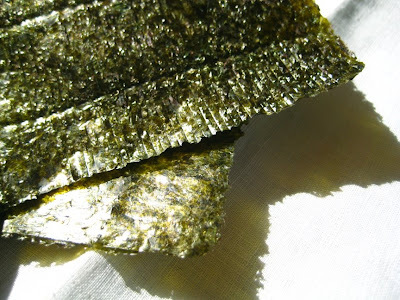 You can find nori in its pre-toasted form in sheets, often called “sushi nori”, but it also comes toasted, which I find best for other dishes. Sea lettuce, “green nori” that resembles lettuce, is excellent in soups, salads, and in rice and noodle dishes. 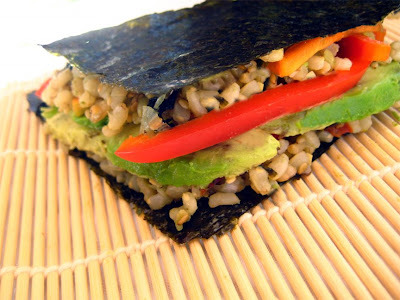 Nori has the highest protein content of the sea vegetable family, a whopping 28% (that’s even more than sunflower seeds, lentils or wheat germ)! It contains very high amounts of calcium, iron, manganese, zinc and copper. Compared to other seaweeds, it also tops the list when it comes to vitamins B1, B2, B3, B6, B12 as well as vitamins A, C and E.
You can now find sushi nori at many grocery stores, but the price tends to be rather inflated. Head down to china town if you want the cheap stuff, or the health food store for the high quality, organically grown variety. Here’s a recipe for sushi sandwiches that is a nice change of pace for picnics or stuffy tea parties. It is very easy to make since it avoids that whole, fiddly rolling situation entirely, and makes you look very “creative”. 1. Cook rice according to the instructions. 2. In a dry skillet over medium-high heat, toast sesame seeds just until they begin to pop. Remove from pan immediately and let cool. 3. Combine rice with toasted sesame seeds, ginger, tamari, and wasabi. 4. Slice vegetables into flat strips. 5. Place 1 nori sheet on a clean surface and cover with a thin layer of rice. Press firmly so that the grains stick together. 6. Layer vegetables on top of rice and top with another layer of rice (kind of like building a lasagna). Lastly, cover with one more sheet of nori. 7. Using a very sharp, wet knife, cut across the large “sushi square”, making 4 triangles. Try to be very quick and precise when cutting, otherwise you will only smash the sushi and make a big mess. Serve with extra tamari, fresh ginger, and wasabi on the side. If it turns out that you can’t roll and you can’t make a sandwich, just fake the whole thing by throwing all of these ingredients into a giant bowl and call it “sushi salad.” No one will ever taste the difference!